I receive questions nearly every week about the best way to put videos on Pinterest. Honestly, I just couldn’t wrap my brain around what would be best. Videos on Pinterest seemed off. When Beth emailed me about how much she loved my podcast and I found out she is a YouTube expert, I knew I had to have her on to see if she could answer all these questions. Beth has a unique perspective on YouTube, due to both her “day job” and her “side hustle”. As a professional at Kin Community, she works with over 160 clients, across all social media platforms, to build their brand. On her own time, she has a very successful YouTube channel called Entertaining with Beth, where she has over 300,000 subscribers and over 20 million views. Her passion is entertaining, with minimal effort for maximum impact. Does video have a place on Pinterest? Beth believes that it definitely does; but it’s all in the way that you use it, and the way that you drive people to videos. When Beth first started using video on Pinterest, she was just using the Pin-it button on her videos and sharing them to the appropriate board. But she wasn’t gaining any traction by doing that. Because she loves Pinterest and really wanted to figure it out, she stuck with it. She realized that video on Pinterest is kind of like a “speed bump”; it causes the user to have to stop cruising along, Pinning as they go, and actually take the time to watch a video. That requires a level of commitment from the user. After trying and trying to make it work, Beth had pretty much given up…until she listened to the Simple Pin podcast, and saw the potential for Pinterest! Because she was also starting a blog at the time, she decided to try a sort of “boomerang effect” to drive traffic to her videos. Beth creates a blog post with Pinnable images, using Social Warfare for hidden images, and embedding the Youtube video into the page. Then she Pins the post to Pinterest, using the optimized images. The images are key to this process – Pinning a small horizontal image for a video isn’t going to draw anyone’s attention. You need to be using Pinterest friendly images in order to draw people in. Here is the key –> she wasn’t leading them to her Youtube channel to sign up; she was leading them to her Youtube subscription link. Every channel has a subscription link, and there are tutorials that show you how to get that. 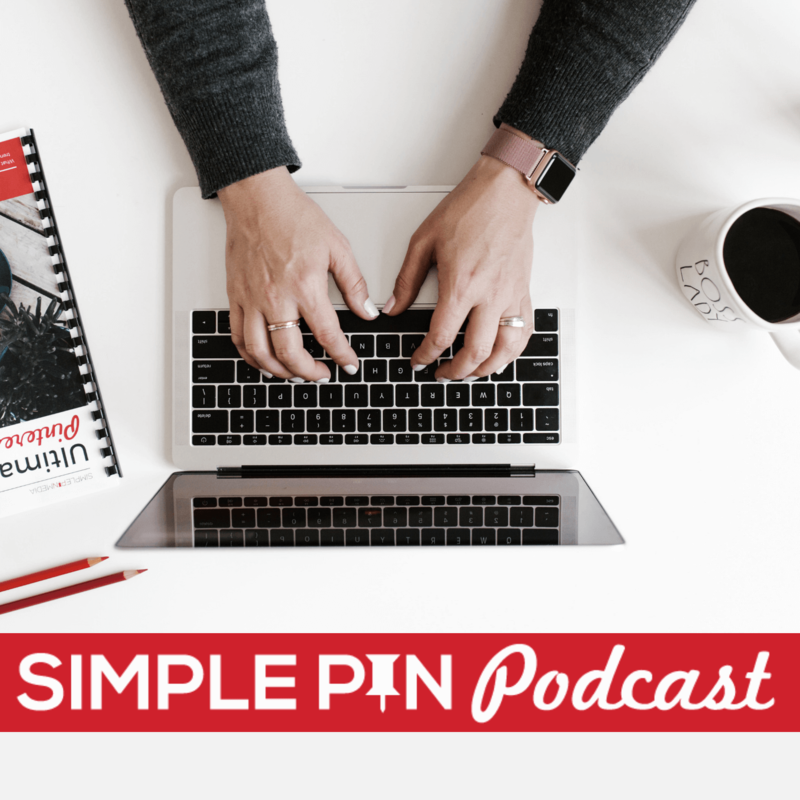 When Beth first began listening to the Simple Pin podcast, she was getting around 3,000 new subscribers a month, which was generating about 400,000 views a month. After using these optimization techniques for around 30 days, she was seeing 7,000 new subscribers a month, views were closer to 800,000, and her minutes watched more than doubled. Video has grown exponentially. The possibility of getting your video seen is higher than ever. What Beth realized throughout this process, was that by bringing people to her blog first, they were becoming more invested in her personally, and by reaching them off of Pinterest, they were more likely to watch a video. And once they watched a video, they were more likely to subscribe. It’s kind of like leaving breadcrumbs for people…it’s hard to catch a rabbit right there…you kinda need to let them come to you a little bit. Youtube is now 10 years old, and the young kids who started watching gaming and make-up videos are now watching Youtube to learn how to cook and how to decorate their own homes. There are so many more places on the internet to share video now than ever before, and because of Pinterest, there are so many more “makers” and DIYers than ever before. Interestingly enough, food is the number 1 category on Youtube right now. Video has grown exponentially in the past 10 years, so the possibility of getting your video seen is higher than ever. You can share it in blogs, on Facebook, on Youtube, and on Pinterest. One of the difficulties of video on Pinterest is that the video doesn’t automatically play like they do on Facebook. You’ve seen those Tasty videos on Facebook, right? They currently have over 1.6 million views. They grab your attention as you are scrolling, and you can’t help but stop to watch. Pinterest is beginning to work with brands to also have automatic play videos. It isn’t currently available for the general Pinterest user, but one day it may be! In the meantime, Beth recommends creating a Pinterest board titled “Recipe Videos on Youtube”, or “DIY tutorials on Youtube”, whatever you are doing videos of. Pin all of your videos to that board. Learn more about creating the best boards for Pinterest. One thing to keep in mind is that video can be quite jarring if you aren’t expecting it. Pinterest users tend to be looking for specific things, or they are dreaming of what they love or might want to try. A video suddenly popping up or starting to play can really interrupt the Pinterest experience. I suggest creating a Pinterest board titled “Recipe Videos on Youtube”, or “DIY tutorials on You tube”. Also, over 80% of the Youtube views are from mobile devices; so if you think of the same amount of video traffic coming from Pinterest, then you see the potential for video on Pinterest. The key strategy though is how they are introduced to it, and how they watch it. The first thing Beth does is post the Youtube video. She watches the first 48 hours of results, knowing that the 48 hour time frame gives a good indication of the ultimate success of that video. Once the video is launched, then she goes back to her blog post that is ready to go, and she has to put the embed code into it. You can’t put an embedcode in until the video is live. Once the video and post are live, and she has Pinned the blog post to all the boards that makes sense, then she uploads the same full length video to Facebook. Facebook gives more space and delivery to videos with captions, so Beth uses a site called rev.com, which will transcribe video for $1 per minute. That transcription should be uploaded to both Facebook and Youtube, as it serves as one huge keyword. Every single word you say in the video becomes searchable. Beth then adds a bitly link to the blog post containing the recipe. This drives traffic to the post, where the hope is that readers will print the recipe, share it on their own social media, Pin it, or even watch the video again, but in the Youtube player this time. What all this does is create a lot of traffic to Youtube, but more importantly it creates a lot of “start sessions” on Youtube. Youtube rewards the channels that get people to the platform and keeps them there. Keep in mind the strong competition between Facebook and Youtube over video right now, and don’t post a Youtube link on Facebook. Because Beth has so recently figured all this out, she has tons of archives she is trying to go back and get all these steps done for. So her recommendation is that you do this from the beginning if you are going to do it. Beth is happy to help anyone who is trying to figure all of this out, and she encourages you to get in touch with her on social media. Want more subscribers on YouTube? If you are looking to grow your YouTube subscribers, consider using the MiloTree app, a Google-compliant pop-up that is super quick to set up and easy to customize. In this day and age of The Great Limited Attention Span, people appreciate being told clearly what to do. The MiloTree app essentially says “Hey! You like this content because you’re here and you’re scrollling. How about more content like this? Subscribe to my YouTube channel!”. Check out my interview with the founder of MiloTree here. What are your tips for Pinterest and YouTube? 2:15 Does video have a place on Pinterest? A great way to take advantage of the social aspects of Pinterest is to create a collaborative board. If we’re connected with our friends, customers or stakeholders, we need to add them to a collaborative board and invite them to post their videos. This is a great way to crowd-source content. Pinterest continues to grow and evolve, video content will become more common-place. Eventually, thanks for sharing your experience pertaining to this beautiful topic. This is brilliant! However, I like to monetize my videos in my blog posts with my ad management team. Could I upload the embed code from my ad team to my blog post, along with the subscribe text like Beth does? Kind of the same concept, just a different embed code in the blog post?